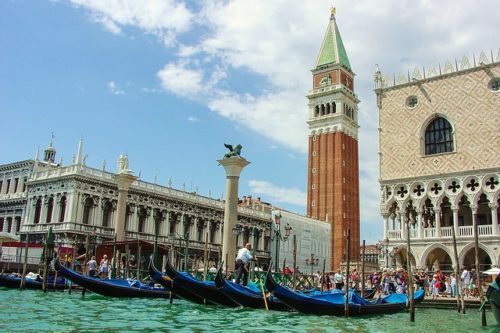 Are you in Venice and you are about to taste its delicious cuisine? Lucky you! Venetian cuisine has pretty traditional and has remained intact for centuries. Are you ready for a journey inside the restaurants and the osterie to taste gnocchi di San Zeno, bigoli, Baccala and frittole? Venice’s cuisine is based mostly on sea-food, but some not-to-forget meals because they are delicious are polenta, a simple dish made of cornstarch, rice, beans and vegetables. And in Veneto region you have to taste Polenta fasoà with bean soup and enriched with lard of pork. First courses includes Polenta and osèi (birds), Bigoli with agole, Bigoli with duck, Farfalle merlot, and among the rice-dishes you can order Riso alla trevigiana (with radicchio and cheese), Risi and bisi, Risotto with frogs (! ), Risotto with Peoci. Gnocchi di San Zeno served with melted butter and cheese, a culinary tradition from Verona, back to XVI century and spread during Carnival’s festivity: potatoes, flour and eggs. Patè di tonno, Bisato in tecia, Anguilla in tegame!!! But the codfish is the king here and Baccalà Mantecato, mostly served with the polenta, is worthy more then a go!! It is also very good also the Baccalà vicentino: it is cooked two hours with milk, or with potatoes or vegetables. Venetian dishes are linked to special festivities, like the Castradina, a dish made of wether’s meat and cooked in occasion of the festivity of Salute. Another speciality is Sarde in Saor meaning anchovies and onions available during the festivity of Redentore. Among the pudding and the dessert we found great the Golossei, a series of candy sweets united with a stick, dusted with sugar, and then let air-cooled. Prepared during the Carnival, it could be considered as ancient lolly-pops! The frittelle (fried dough) is another typical sweet of Carnival. The Galani is very very thiny: made with flour, eggs, sugar, salt, butter and a little anisette. The Tiramisù comes from Veneto, some says. or from Tuscany? Many relialable sources states the winner as Venice with its original recipe: mascarpone, eggs, savoiardi biscuits, coffee, Marsala and cacao! Taste all with a fantastic regional wine, the Recioto di Soave and Renobilis. This entry was posted on Wednesday, September 5th, 2012 at 6:56 pm	and is filed under Discover Italy. You can follow any responses to this entry through the RSS 2.0 feed. You can leave a response, or trackback from your own site.